State transport services which werein a standstill for the last four days in Maharashtra in the midst of Diwali, have finally resumed its operations on Saturday morning after the workers’ body decided to withdraw the strike on its fifth day. The strike withdrawn after a Bombay High Court order termed the strike “illegal” and directed the state government to formulate a high level committee to resolve the grievances of the staffers. Drivers, conductors and other staffers of Maharashtra State Road Transport Corporation (MSRTC) were on an ‘indefinite strike’ since October 17 for their demands pertaining to pay hike. A joint action committee (JAC) comprising of over a dozen unions representing MSRTC staffers across the state had held several meetings with the state government including State Transport Minister Diwakar Raote and Chief Minister Devendra Fadnavis but it did not lead to any solutions. On Friday, while hearing a public interest litigation (PIL) filed by Jayant Satam, a Mumbai based journalist, a single judge vacation bench of HC had termed the strike “illegal” and directed the MSRTC staffers to end the strike and resume the regular services immediately. HC had also directed the state government to form a high level committee by Monday (October 23) to consult the ST workers’ unions and submit its interim decision on pay hike by November 15 and a final decision about the same by November 22. 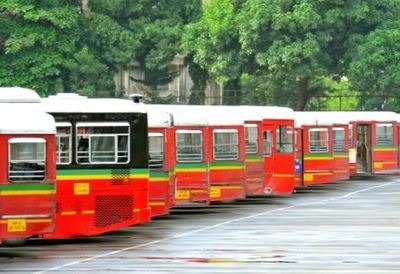 After holding deliberations following the HC directives, joint action committee of MSRTC workers’ unions issued a statement early morning on Saturday and said that considering the HC directives to the staffers as well as to the state government, a decision to withdraw the strike has taken. Be the first to comment on "MSRTC strike: resume on fifth day after Bombay HC order"